Whether you followed my clean up plan to a " T", or used it as a spring board to set yourself up for success the first week into the New Year, the question of how to sustain the positive momentum is quite valid. Most people give up on their resolutions by mid-January due, in part, to setting severe protocols. If your goal is to work out everyday, abstain from alcohol for a month, or go gluten and dairy-free for life, living in extremes is not sustainable or particularly enjoyable. Life is about balance and being in control of your eating habits. I don't believe in setting unrealistic resolutions that set you up for failure and disappointment. I do believe in making mindful modifications that you can slowly integrate into your daily or weekly routine and will stay with you long term. Instead of trying to go vegan or eat mainly a plant-based diet, start instituting meatless Monday. If having a home cooked meal five days a week is too overwhelming, start with two meals that can be repurposed for lunch. Trying to workout 6 days a week? How about signing up for two classes once a week that make you happy. Instead of dry January, how about drinking only on the weekends? Integrating little changes into your life are achievable ways to feel better about the big picture. The root of my philosophy is based on getting yourself into the kitchen and cooking. When you prepare food, regardless of its simplicity, you have control over your meal. You monitor the salt, the oil, the butter, and the quality of ingredients used. The main struggle that I hear from clients and friends involves the time commitment needed for cooking. That late nights at the office or social engagements get in the way of cooking nourishing meals. But, by prioritizing your health, wellness, and calendar, you can easily prep simple meals to enjoy throughout the week. I highly encourage readers to spend two to three hours on a Sunday or whatever your day off may be, preparing staples for the week. Keep it simple and adaptable for the season. Make a soup, roast two sheet pans with different vegetables, cook a pot of beans, make oatmeal or overnight oats, wash and dry salad greens, and prep a hardy grain to mix and match for meals throughout the week. I like to keep fresh herbs available to add vibrancy to dishes before eating and always have a good quality olive oil, a few different vinegars, and dijon mustard on hand. Here are some of my standby meals which can be made in advance and enjoyed throughout the week. Lunch is the perfect place to repurpose leftovers and serve them over mixed greens or have a soup filled with vegetables and beans. You could also simply have a balanced salad full of dark leafy greens, 1/4- 1/2 cup of whole grains, beans, roasted or raw vegetables, and some hemp seeds. Add a side of fermented veggies and you are good to go. Don't overthink it. Soups and stews are my personal "go-to" dinner of choice and are a great option that is simple to reheat and repurpose throughout the week. 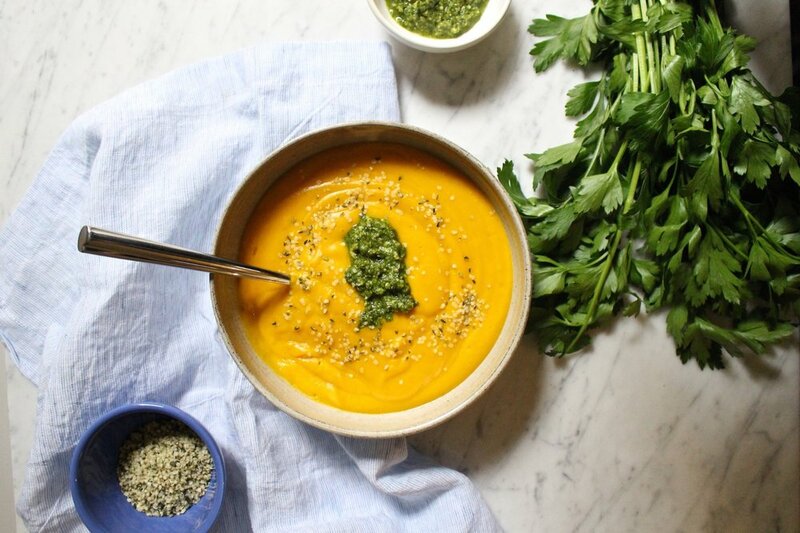 Most soups and stews get better with "age". If you make a hearty option like a bean soup or chili, serve on a sweet potato, in a grain bowl, or over spaghetti squash for some diversity. Repetition, leaning on leftovers, and keeping it simple is the foundation for years of clean eats. Of course, I endorse conscious indulgences, whether it is a bowl of pasta from your favorite restaurant or one of your mom's famous homemade cookies, or a martini. Leading a happy and nourished life is about balance. The key to leading a plant-based lifestyle is being nutritionally mindful and balanced without feeling like you are missing out or are deprived. I encourage you to practice the principles of making plants the main part of your plate and add in animal proteins here and there, if you want to. Just consider only integrating high quality protein that was raised in a sustainable way. Maintain the intention to consume primarily whole foods that are unprocessed and as close to their natural state as possible. Make plants the main part of your plate, and if you decide to eat animal protein, have it be in a supporting role and in moderation. If you indulge a bit, get back on track with the key concepts and recipes addressed in the clean-up. Living a clean and balanced lifestyle is learning how to make it work for you. Start shopping more at your greenmarket, join a CSA, have one vegan meal a day or a week, and practice meatless Monday. These small shifts and modifications toward a more plant-based, whole food lifestyle can help change your health and the environment, one eater at a time. 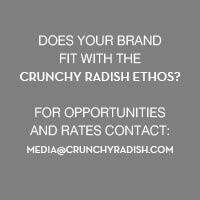 Ahead are the Crunchy Radish principles to assist you in doing just that. Make vegetables the priority of your plate. Focus on whole grains such as oats, quinoa, amaranth, bulgur, and brown rice. Remove the white stuff - white flour, white sugar, white rice. Add real whole food vegan protein into your diet, not the powders. Legumes, nuts, seeds, and whole grains are easy and clean alternatives. Don't be a meal skipper. Fuel your body with a snack or a meal every three to four hours. Spice it up. Add hot sauce, chili flakes, spices, citrus zest, fresh herbs, and microgreens to your meals to make them more vibrant and flavorful. Stock your pantry with salad dressing staples that can also be used on roasted or steamed veggies. Olive oil, white balsamic vinegar, red wine vinegar, apple cider vinegar, dijon mustard, sesame oil, local honey, and maple syrup are the basics. Stick to one cup of coffee a day. Swap in matcha or green tea for your afternoon pick-me-up. Water, water, water. The "gold standard" is eight glasses a day. Shop your farmers market or join a CSA to eat with the seasons and support local agriculture. Purchase items that are not processed or found in a box or bag. This means mainly fresh produce, grains, beans, nuts, and seeds. Optimize your gut. Make sure to include gut friendly bacteria into your diet from miso, kefir, cultured yogurt, and fermented vegetables. If you eat animal protein, pare back portions and frequency. Focus on the quality of what you are eating - pasture raised eggs and chicken and grass-fed, hormone-free meat. For seafood the Montery Seafood Watch site provides an excellent resource for sustainable and safe fish and seafood. Sweeten foods naturally with dates, bananas, maple syrup, coconut sugar, and honey. Find ways to move that make you happy. Try a new workout to keep it fresh and interesting. Aim for at least four workouts a week. Limit alcohol to four drinks a week. Stick to the basics - wine and clear spirits mixed with sparkling water and citrus.